For Breakfast this morning I mad a Poached Egg that I served on a slice of toasted Aunt Millie’s Light Whole Grain Bread. I also heated up a couple of Johnsonville Turkey Breakfast Sausage Links and had a cup of Bigelow Decaf Green Tea. Well our Artic Cold Front has moved in overnight. 50 degrees yesterday and this morning its 9 degrees with a wind chill around minus 1. Only a high of 19 degrees. Even colder tomorrow! So not a lot going on outside. I did a few chores around the house. For Dinner tonight Pan-Fried Dover Sole w/ Rice/Wild Rice and Green Beans. I’m trying another new kind of Fish that I purchased from Sea to Table, West Coast Dover Sole. Sole is a flaky and mild flavored fish with a sweet flavor. As the other Sea to Table Products it comes frozen with 4 fillets per package. I’m preparing all 4 of the fillets. To make tonight’s dish I’ll need; McCormick Grinders of Sea Salt and Peppercorn Medley, Lemon Juice, and Progresso Italian Style Bread Crumbs. I washed the Fillets off in cold water. Then seasoned them with the Sea Salt and Peppercorn Medley. Then rolled the Fillets in the Bread Crumbs and let sit for 5 minutes. Next I got a large skillet and sprayed it with Pam Non Stick Spray and heated it on medium heat. As the skillet was heating up I added 1 1/2 tablespoons of Extra Light Olive Oil. With the skillet heated I added the 2 fillets. As they started cooking I drizzled a bit of Lemon Juice across both fillets along with Dried Parsley. I cooked them for 3 minutes then flipped them over and continued cooking them for another 3 minutes, until both sides were a beautiful golden brown. As the Winter Skate was a couple of nights ago, the Dover Sole is just as good! Fried up perfect, nice crust. The Sole was as described; flaky with and light sweet taste to it. Excellent Fish, look forward to having it again soon! As the Fish was cooking I prepared a box of Lundberg ORGANIC WHOLE GRAIN and WILD RICE – ORIGINAL. It’s been quite some time ago since I’ve had this! I bought a couple of boxes of it on my last visit to Jungle Jim’s International Market. I first sliced up some Baby Portabella Mushrooms. I’ll also be adding some Kraft Reduced Fat Grated Parmesan Cheese to it. To prepare it; In a medium saucepan I combined 1 ¾ cups of water, sliced mushrooms, rice, beans and seasoning packet, and 1 Tbsp. extra light olive oil. Stirred well and brought to a boil. Cover and reduced the heat to low. Instructions said do not lift lid while cooking. Simmer for 32 minutes. Remove it from the heat. Let stand covered for 5 minutes. Fluff with fork and sprinkle with the Grated Parmesan Cheese and serve. Very, very, good Rice Dish as all the Lundberg’s Products are. I also heated up a small can of Del Monte Cut Green Beans. Love having these Fish Dinners! For Dessert later a Jello Sugar Free Dark Chocolate Pudding. * Why We Love It: Similar to other flatfish such as fluke, Dover Sole has a sweet flavor with a flaky and delicate texture – perfect for a simple yet eye-catching plate. Unlike the European Dover Sole, West Coast Dover Sole is a member of the flounder family. * Cooking Tip: For a classic French-inspired meal, pan sauté in a butter and caper sauce, sprinkle with parsley and serve with asparagus and roasted potatoes. Get the recipe. * Where It’s From: Dover Sole, rated as a Best Choice by Seafood Watch, is from Astoria, Oregon, a small fishing town of about 10,000 people located at the mouth of the Columbia River just a few miles from the Pacific Ocean. * Our Guarantee: We care about the fish you eat and work closely with our supply partners to provide you with the very best. If you are not 100% satisfied, we will replace or refund any item within 30 days. Enjoy this delectable blend of rice and spices. You’ll love the garlic, onion, olive oil, and spices combined with the nuttiness of brown rice and the firm texture of wild rice. Together they make an aromatic dish your whole family will love. In a medium saucepan combine 1 ¾ cups of water, rice, beans & seasoning packet, and 1 Tbsp. olive oil (optional). Stir well and bring to a boil. Cover and reduce heat to low. Do not lift lid while cooking. Simmer for 32 minutes. * Great with rotisserie chicken or diced cooked turkey. * This rice makes a delicious addition to your favorite Thanksgiving stuffing. * To make a tasty side dish for pork loin, add dried cranberries, caramelized onions and orange zest. * For additional flavor, substitute water with fragrant tea such as jasmine or green tea. Organic Parboiled Brown Rice, Organic Wild Rice, Organic Dried Garlic, Sea Salt, Organic Brown Rice Flour, Organic Dried Onion, Organic Dried Cane Syrup, Organic Spices (Black Pepper, Parsley), Organic Rice Concentrate, Organic Extra Virgin Olive Oil. This week’s Soup Special of the Day is a Creamy Chicken and Wild Rice Soup. Perfect Soup for these Fall Days, Enjoy! 1 – In a large pot over medium heat, combine broth, water and chicken. Bring just to boiling, then stir in rice, reserving seasoning packet. Cover and remove from heat. 2 – In a small bowl, combine salt, pepper, cumin, cayenne pepper and flour. In a medium saucepan over medium heat, melt butter. Stir in contents of seasoning packet until mixture is bubbly. Reduce heat to low, then stir in flour mixture by tablespoons, to form a roux. Whisk in cream, a little at a time, until fully incorporated and smooth. Cook until thickened, 5 minutes. 3 – Stir cream mixture into broth and rice. Cook over medium heat until heated through, 10 to 15 minutes. To start my morning off I made a Ham, Cheese, and Egg Breakfast Sandwich and my morning cup of Bigelow Decaf Green Tea. I used Boar’s Head Black Forest Ham, a slice of Sargento Ultra Thin Sharp Cheddar Cheese, Scrambled 1 medium size Egg, and used Healthy Life Whole Grain Bread. After Breakfast I did some cleaning around the house. Then after a light lunch I headed over to spend the afternoon with Dad. My Dad is not looking good at all. I don’t know if he’s going to recover from this, we can only pray and hope. Back home I did some laundry for Mom. So for dinner tonight I prepared a Pan Seared Oven Roasted Skinless Boneless Chicken Breast w/ Red Beans & Rice and Sliced Carrots. While at Meijer a while back I came across some beautiful huge Chicken Breasts. They were so good the first time around I couldn’t wait to use them again. I prepared them like I did last week, Pan Seared Oven Roasted Skinless Boneless Chicken Breast. To season them I‘ll need McCormick Grinder Sea Salt and Peppercorn Medley along with Litehouse Poultry Herb Blend. I love the Litehouse Poultry Herb Blend it’s a blend of Herbs; Onions, Thyme, Sage, Marjoram, Spring Onions, Garlic, and Rosemary. I had the Chicken in the freezer so I laid it out overnight in the fridge to thaw. To prepare; I preheated the oven on 400 degrees and I got my favorite skillet out, the Cast Iron Skillet. Sprayed a light coat of Pam Cooking Spray w/ Olive Oil on it and added 1 tablespoon of Extra Virgin Olive Oil to it. Heated it on the stove on medium high. I then seasoned the Chicken Breasts with my 3 seasonings. With the skillet and oil heated I added my Chicken. Browned both sides for 3 minutes. Transferred the skillet to the preheated oven. Baked for 15-20 minutes until a 165 internal temperature. And like the first time I made these, the Chicken Breast came out perfect! Moist and full of flavor. I served it with a side of JB’s Fat Boy Sticky Stuff BBQ Sauce. The Cast Iron Skillet is perfect to use when starting a dish on the stove and finishing in the oven! 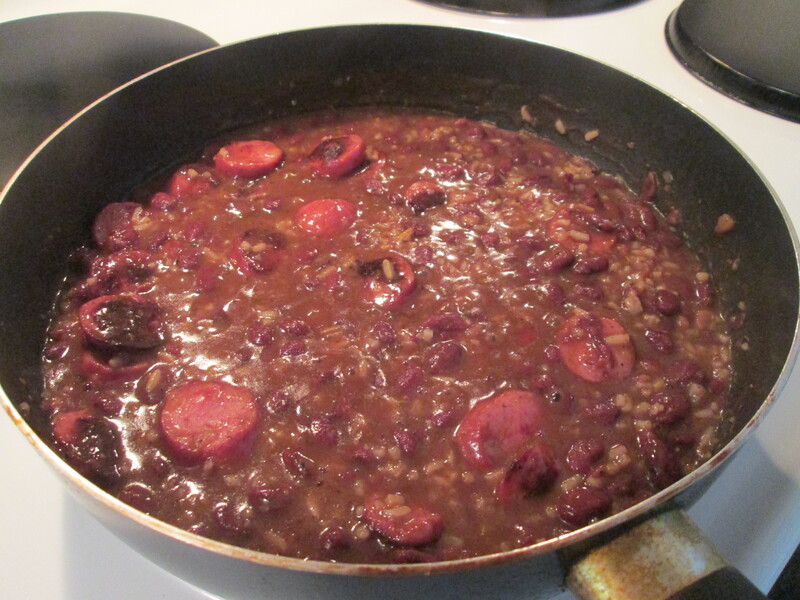 For one side dish I prepared a can of Glory Foods Seasoned New Orleans Style Red Beans and Rice. First time I’ve tried this item and was really pleased! To prepare it just empty the contents into a medium sauce pan. Cover and bring to a boil. Stir and reduce heat. Simmered gently until hot and served. The Beans and Rice were both good with excellent seasoning. Another item for the pantry. For a second side I heated up a can of Kroger Brand Sliced Carrots, same preparation as the Beans and Rice. i also had a couple of slices of Healthy Life Whole Grain Bread topped with I Can’t Believe It’s Not Butter. For dessert later a Skinny Cow Chocolate Truffle Ice cream Bar. Compare Healthy Life Breads to other breads and you’ll know why Healthy Life Bread is the Answer! I’ll start off by wishing my Mom a “Happy Birthday”, she turns 88 today! I just hope if I reach that age that I’m able to get around and do things as good as she does. Love you Mom!! I made Breakfast this morning for all of us. I prepared what is quickly becoming our favorite Breakfast dish, Ham and Diced Potato Skillet. I used Simply Potatoes Diced Steakhouse Potatoes and a package of Meijer Diced Ham. Using a Cast Iron Skillet I started by frying the Diced Potatoes. After about 9 minutes I then added the Diced Ham and stirred. In about 14 minutes it was ready! As the Potato/Ham was finishing I grabbed a small skillet and fried one Egg, Sunnyside Up. To serve made a bed of Potatoes and Ham and topped that with the Sunnyside Egg. Broke the Egg open and it just pulled the entire meal together! One hearty Breakfast and a favorite of Mom and Dad’s! After Breakfast I gave Mom her Birthday Presents and Birthday Cake. Afterwards I went to Meijer for a few items, I’m using Meijer more and more. For dinner tonight I tried a new recipe, Black Bean Chicken with Rice Recipe w/ Baked Italian Loaf Bread. I came across this recipe in an issue of Simply Delicious (Taste of Home). Black Beans, Chicken, Rice and throw in Corn and Salsa I was sold For the Chicken I used Perdue Perfect Portions Chicken Breasts. I use the Perdue Perfect Portions Chicken Breasts quite often. They come in a package of 5 breasts and 2 types; Italian Seasoned and Plain Breasts. Anyway I grabbed 2 of the Breasts out of the freezer and let them thaw overnight in the fridge. To season the Chicken I’ll need 2 teaspoons Extra Virgin Olive Oil, 3 teaspoons Chili Powder, 1 teaspoon Ground Cumin, 1 teaspoon Pepper, and 1/4 teaspoon Sea Salt. To make the dish I’ll need; the Perdue Perfect Portions Chicken Breasts, 1 can Bush’s Low Sodium Black Beans, Sliced Black Olives, 1 container of Uncle Ben’s Natural Whole Grain Brown Rice, 1 can Del Monte Summer Crisp Golden Sweet Corn, and Kroger Organic Medium Salsa. To prepare the dish In a small bowl, mix the seasonings; sprinkle over both sides of chicken. In a large nonstick skillet coated with Pam Cooking Spray, heat olive oil over medium heat. Brown the chicken on both sides. Add the beans, olives, corn and salsa to skillet; cook, covered, 10-15 minutes or until a thermometer inserted in chicken reads 165°. Remove chicken from pan; cut into slices. Serve with bean mixture and rice. Wow, INCREDIBLE! Another delicious recipe from Taste of Home! Just a fantastic combination of ingredients! Beans, Chicken, Olives, Rice, Corn, and the Salsa just seems to bring it altogether. Another one of those “Keeper Recipes”. Plus it’s a one pot meal, which I love, and easy cleanup. The original recipe and web link is at the end of the post. I also baked a loaf of Pillsbury Italian Loaf Bread. For dessert later a bowl of Breyer’s Carb Smart Chocolate Ice Cream. 1 – In a small bowl, mix seasonings; sprinkle over both sides of chicken. In a large nonstick skillet coated with cooking spray, heat oil over medium heat. Brown chicken on both sides. 2 – Add beans, corn and salsa to skillet; cook, covered, 10-15 minutes or until a thermometer inserted in chicken reads 165°. Remove chicken from pan; cut into slices. Serve with bean mixture and rice. Yield: 4 servings. 1 chicken breast half with 3/4 cup bean mixture and 1/2 cup rice equals 400 calories, 7 g fat (1 g saturated fat), 63 mg cholesterol, 670 mg sodium, 52 g carbohydrate, 8 g fiber, 32 g protein. Started my morning off with a Healthy Life Whole Grain English Muffin and on that I fried up some Boar’s Head Honey Smoked Ham. Topped that with a slice of Sargento Ultra Thin Swiss Cheese and I was set. Also had my morning brew of Bigelow Decaf Green Tea. They released my Dad from the hospital, he’s feeling better but he’s still awfully weak. Went to Kroger early this morning to pick up a few items for me and Mom. I needed a package of Healthy Life Whole Grain English Muffins. They had 2 packages left on the rack and both had mold on them, not real good publicity for Kroger! Sad part is it’s not the first time. Anyway for dinner tonight another new recipe, Kielbasa Skillet. I prepared Kielbasa Skillet w/ Baked Rustic French Bread. Wasn’t real sure of what to have for dinner tonight. 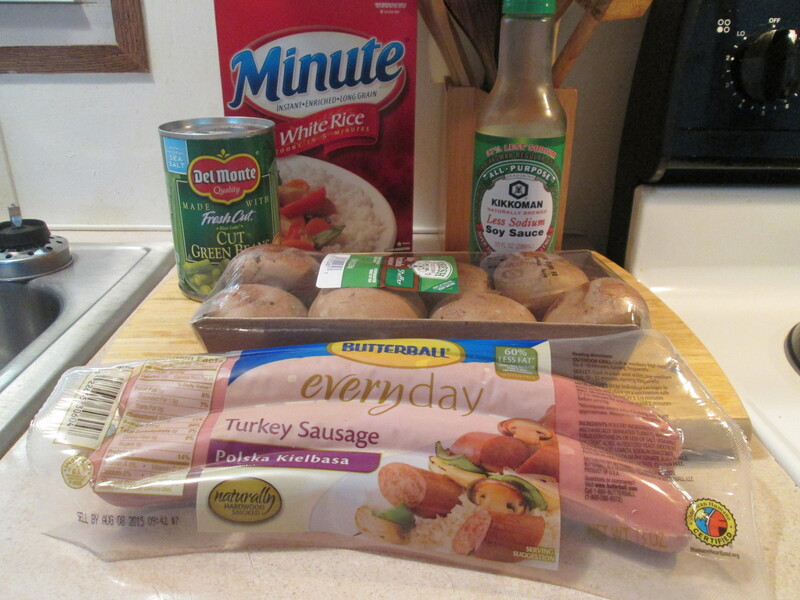 Then while at Kroger earlier today I came across some Butterball Every Day Polska Kielbasa Turkey Sausage, I found dinner! I use the Butterball Hardwood Smoked Turkey Sausage all the time, it had been a while since I had the Kielbasa. Next was finding the right recipe. Which I did on the Taste of Home website, which I use all the time for finding recipes. So a new recipe tonight, Kielbasa Skillet. 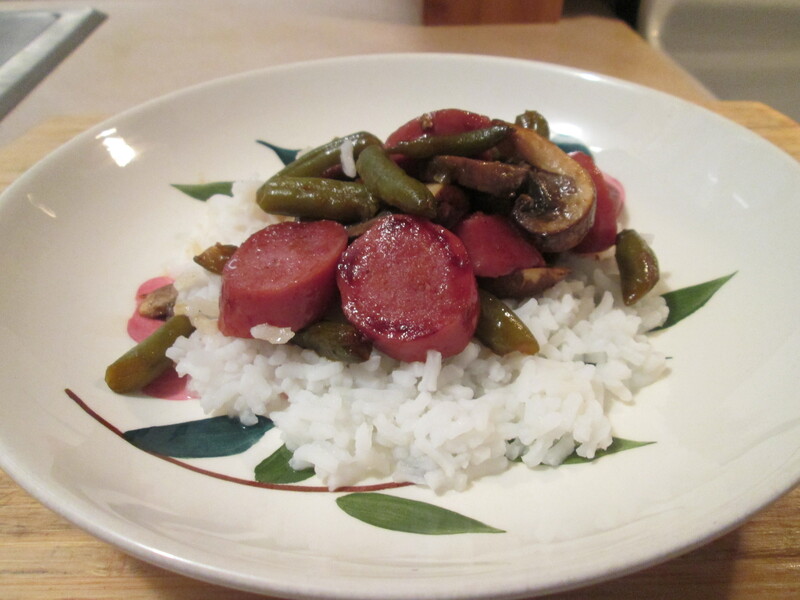 I doubled the recipe so I needed the following; 1 pound Polska Kielbasa Turkey Sausage (sliced), 2 cups Del Monte Cut Green Beans, 1 cup sliced fresh Mushrooms, 2 tablespoons Kikkoman Less Sodium Soy Sauce, and 2 cups Uncle Ben’s White Rice. I used Cut Green Beans instead of French – Style Green Beans, I just prefer the Cut over French. The original recipe is at the end of the post. To prepare it; In a large skillet coated with cooking spray, saute Kielbasa until browned. Add the Beans, Mushrooms and Soy Sauce; saute 4-5 minutes longer or until vegetables are tender. Serve with Rice and get ready to enjoy one delicious skillet meal! Everything works in this recipe. 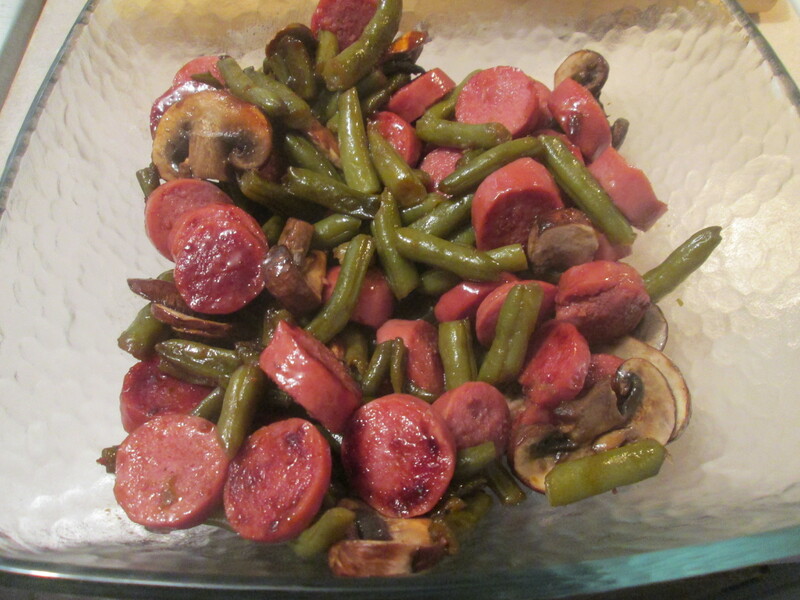 The Sausage is delicious and packed with flavor and the Beans and Mushrooms go great with the Sausage. And the Soy Sauce provides the great flavor. Very good recipe and great recipe to keep! I also baked a loaf of Pillsbury Rustic French Bread. For dessert later a bowl of Breyer Carb Smart Vanilla Bean Ice Cream. 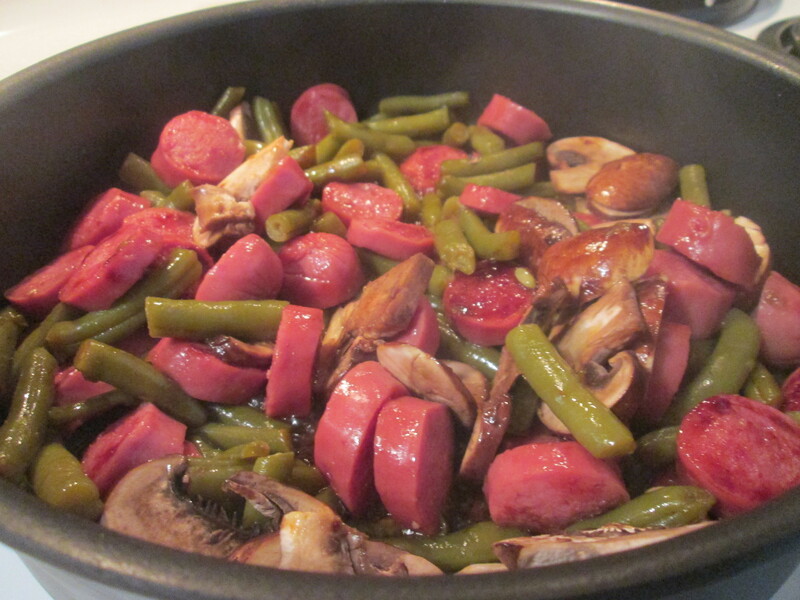 In a large skillet coated with cooking spray, saute kielbasa until browned. Add the beans, mushrooms and soy sauce; saute 4-5 minutes longer or until vegetables are tender. Serve with rice. Yield: 2 servings. 1 cup kielbasa mixture with 1/2 cup rice (prepared with turkey kielbasa) equals 279 calories, 7 g fat (2 g saturated fat), 71 mg cholesterol, 1,421 mg sodium, 31 g carbohydrate, 2 g fiber, 23 g protein. * The recipe calls for Halibut but you could also use Sea Bass, Tilapia, or Flounder. 1 – Place fillets in a shallow dish, cover with green onion and ginger. Combine liquid ingredients and pour over fish. Marinate fish for 10 minutes. 2 – To Steam Fish: Use a bamboo or metal steamer. Set steamer rack over boiling water. Water should not touch the rack. Place fillets on a plate and set on the rack. Pour remaining marinade over fish, cover and steam 10 minutes per inch thickness of fish. (No need to turn fish during cooking.) Fish is done when flesh turns opaque and flakes easily with a fork. 3 – Before serving, pack 1/2 cup measure with cooked rice and turn out on individual dinner plates. Gently flatten the mound with the back of a spoon to form a round pillow shape. 4 – Serve the steamed fish on the rice pillows, pour hot marinade liquid over each fillet. Garnish with a slice of lemon and green onion strips. Wow, had to turn the heat on this morning it was a bit chilly. I think it was about 32 degrees and still a cold wind all day but sunny. Breakfast, workout, and a shower and out the door. ran an errand for Mom and I was close to a nearby Meijer so I stopped in there to grab a few of their sale items and back home for the day. Day 5 of the “Freezer Meals Week”. Tonight I’m using Butterball Hardwood Smoked Turkey Sausage I had in the freezer and I laid it in the fridge to thaw overnight. Tonight its Red Beans and Rice w/ Hardwood Smoked Turkey Sausage and Cornbread. I started by preparing the Turkey Sausage. I used Butterball Hardwood Smoked Turkey Sausage. I took one of the Sausages and cut it in to bite size pieces. Using a medium size skillet that I sprayed it with Pam cooking Spray, also added a 1/2 tablespoon of Extra Virgin Olive Oil, and heated it on medium. When the skillet was heated up I added the Turkey Sausage pieces. I cooked them about 12 minutes, stirring them frequently. When done removed the skillet from the heat and set aside, I’ll be using the same skillet for my Grandma Maud’s Red Beans and Rice. I prepared some of Grandma Maud’s Red Beans and Rice, first time in a while since I’ve prepared this. 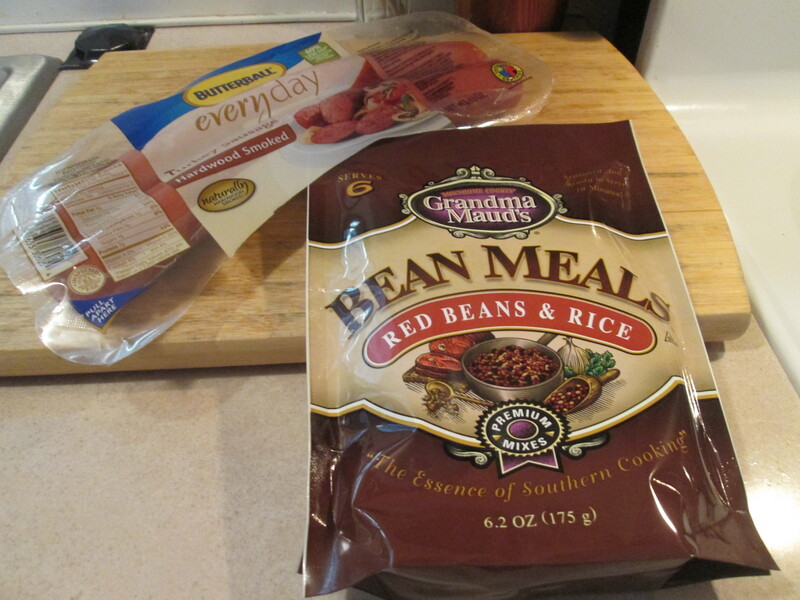 Just follow the easy instructions on the package and you have some great Red Beans and Rice! It had a good Cajun Seasoning to it and was only 100 calories and 16 net carbs. As the Red Bean’s and Rice was finishing I added the Smoked Turkey Sausage slices, stirring in till well mixed. 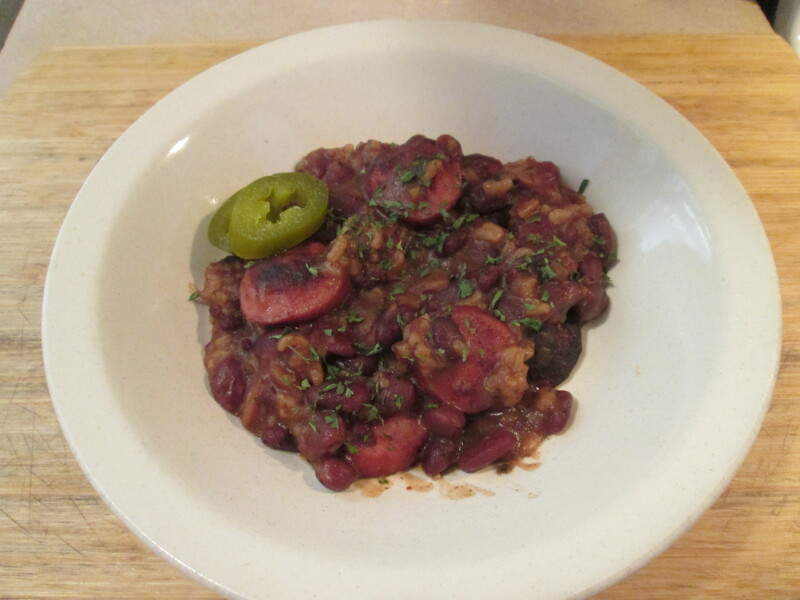 The Smoked Turkey Sausage paired with Red Beans and Rice is a perfect pairing! Nice heat, Smokey Flavor, and just flat-out delicious! Added a couple of slices of a Jalapeno Pepper and a splash of Frank’s Red Hot Sauce to spice it up a bit more. 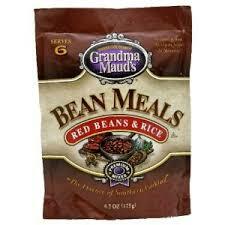 Full instructions and site link for Grandma Maud’s Red Beans and Rice is at the end of the post. I also made a small Cast iron Skillet of Cornbread. As always I used Martha White Corn Meal Mix, something I think I could eat every meal. I like a nice fresh and hot slice with Butter on it. When I make this I just make it by the instructions on the package but I only use half the ingredients because I use a small cast iron skillet to make it. I use Egg Beaters and Extra Virgin Oil instead of Eggs and Vegetable Oil the recipe calls for. 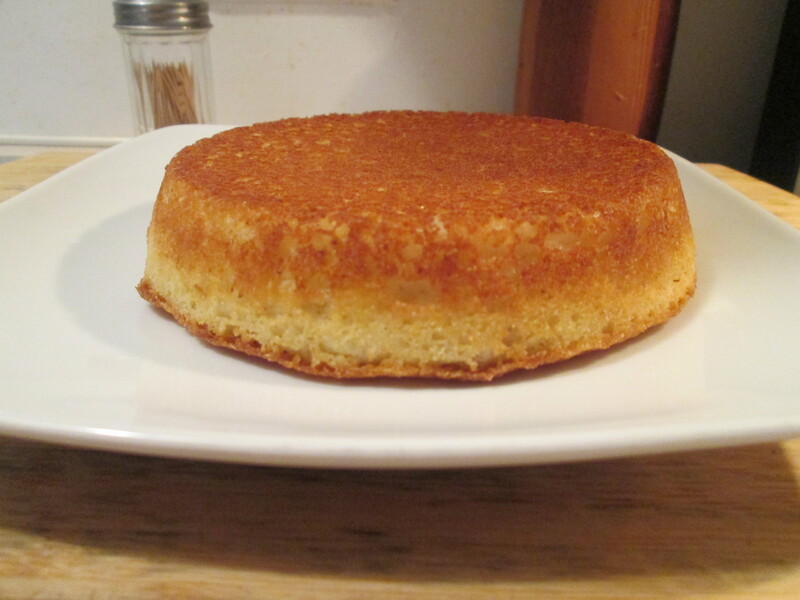 Bake at 450 degrees for about 25 minutes and you have some golden brown piping hot Cornbread! If you use a small cast iron skillet just cut the recipe in half and it comes out just right for the skillet size. What a dinner tonight! For dessert later a bowl of Breyer’s Carb Smart Vanilla Bean Ice Cream. Authentic southern Cajun flavors combined with a rich, smoky essence make Grandma Maud’s Red Beans & Rice an easy side dish or complete meal with no added meat or fat. I believe we have our Indian Summer going on here in west Chester. They say it’s usually after the first frost, most of our area had their first one Tuesday morning. Then about a day later the temps started climbing, a high of around 64 today. Then they’re calling possibly for record highs near 80 degrees for the next few days. So this might be our last blast of heat. Not much going on today, got some housework done and settled in for another afternoon of Football, NFL this time. 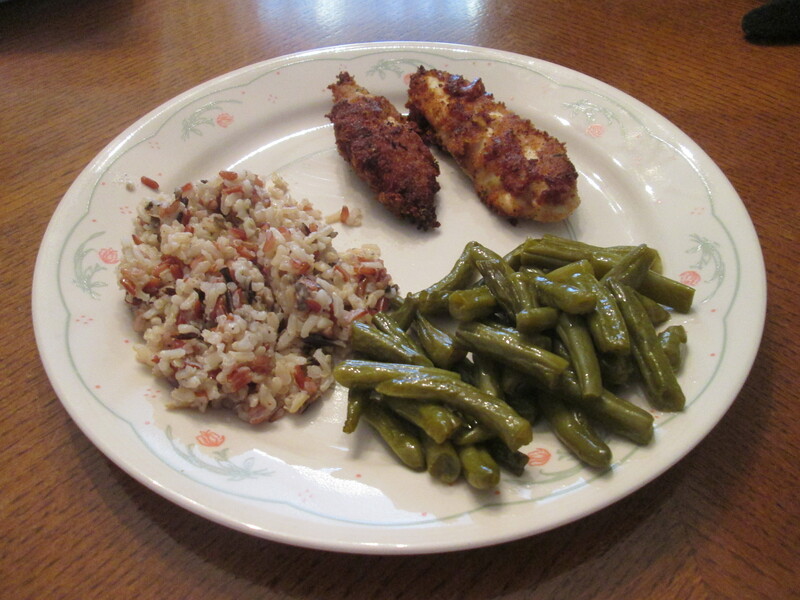 For dinner tonight I prepared Fried Chicken Tenders w/ Multi – Grain Medley and Cut Green Beans. I used Kroger Simple Truth Natural Chicken Tenders. I seasoned the Tenders with, McCormick Perfect Pinch Parmesan Herb Seasoning, Sea Salt, and Ground Black Pepper. Then I got some Low fat Buttermilk and poured a cup of it in a plastic container and mixed about 5 shakes of Frank’s Red Hot sauce into it, mixing well. I then added my Chicken Tenders to it, sealed it and set it in the fridge to marinate. When it came time to prepare them I removed them from the marinade, shaking off any excess of the Buttermilk mix. I laid them on a large dish that I had already added Shake and Bake Seasoned Panko to. Rolled the Tenders in the Panko until all sides were covered with Panko Crumbs. Let them sit a few minutes and I used a large skillet, I sprayed with Pam w/ Olive Oil Spray and added 2 tablespoons of Canola Oil to. Heated the skillet on medium heat. After Oil was heated I added my Tenders. I cooked them about 5 minutes per side until golden brown and 165 internal temperature. They came out delicious! The seasoning was spot on and the Buttermilk and Hot Sauce mixture gave it a fantastic taste. The Panko gave it a beautiful crust. As they say “Winner, Winner Chicken Dinner”. 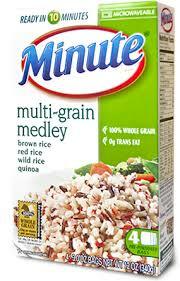 For one side dish I tried a new one, Minute Multi-Grain Medley. I seen this advertised the other day and it looked and sounded great so I picked up a box of it at Walmart yesterday. It has Brown Rice, Thai red Rice, Wild Rice, and Quinoa. Now that’s a good combo of Grains! The box contains 4 – 2 Serving Packets and easy to prepare. Combine water and the contents of one bag in medium saucepan and stir. Add oil if desired. Or, if desired, to add more flavor, substitute broth, fruit or vegetable juice for water. Bring to a boil, reduce heat, cover and simmer 10 MINUTES or until water is absorbed. Remove from heat. Fluff with fork and serve! Esay to prepare and makes one excellent side dish. Another staple for side dishes. Plus it’s only 160 calories and 31 net carbs. Then I also heated up a small can of Del Monte Cut Green Beans. For dessert later a Healthy Choice Dark Fudge Swirl Frozen Greek Yogurt.